Soaring higher than most towers in the Mississauga skyline, this condo will have 48 storeys and will be south of the first tower. 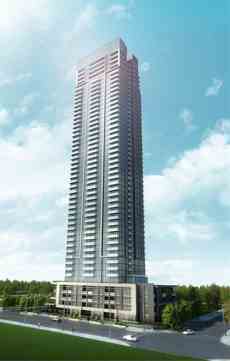 Conveniently located on Burnhamthorpe, Pinnacle Grand Park 2 will fascinate and impress you. This second tower is a lot skinnier and taller than the first tower and it has, unlike most condos, separate amenities. This way, the residents get full advantage of their own amenities, no gym line ups and tireless waits for the party room. This condo offers you a resort right at your feet. If exercise and wellbeing along with a holiday feel are at the top of your list, then the Pinnacle Grand Park 2 is just the right condo for you. It’s health and wellness club offers a rejuvenating feeling. Take a dip in the large swimming pool, relax in the whirlpool or sauna or soak in the sun on the sundeck terrace. The gym facility also features a separate room for all those yoga enthusiasts. If you like to entertain there is a large private dinning room with a massive kitchen for that perfect birthday or get together. If you plan on having your best birthday ever, try going for a cocktail themed party in the spacious party room. If you only have a few friends visit, then you can hang out in the games lounge or catch the latest flick in the theatre room, with popcorn that you can make downstairs in the kitchen. The BBQ area is for all the steak lovers. There is a study, for quiet reading and relaxing. Guests can get comfortable in the guest suites, right next to the amenities. This condo is located at a prime location in the Mississauga downtown core, surrounded by all the entertainment, restaurants, shopping, business, banks, stores, salons, transportation and highways. 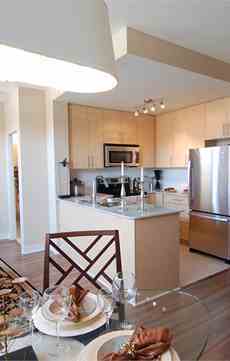 Although it is in the downtown core, this condo is a little bit of to the side. It does not run on two busy streets like a lot of the city centre condos. This allows for a nice walk to Square One Mall, yet it is quiet enough to get some sleep at night on the weekends. Also close by is Celebration Square, YMCA, the Living Arts Centre, Sheridan College, many parks, golf courses, hiking trails, schools and more! This condo is convenient for young professionals who work around Square One, families with children going to school, couples that enjoy quiet time in the building with all the advantages of the amenities, and even retired residents who enjoy a stroll in the park, golfing or hiking. Getting in and out of the city is easy, with the 403 being minutes away.